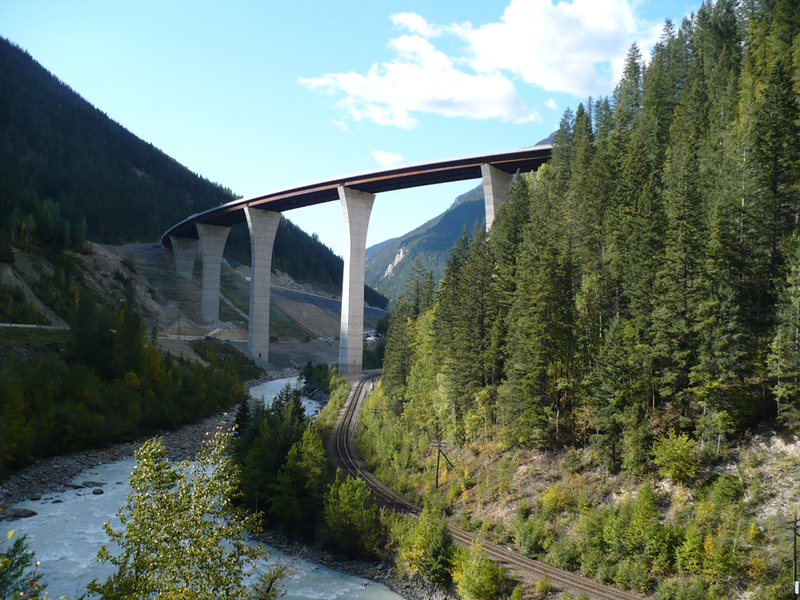 Flatiron reconstructed approximately three miles of a new four-lane highway and constructed a new Park Bridge over the steep Kicking Horse Canyon in British Columbia. The 1,328-foot-long bridge was the first curved incrementally launched bridge in North America, supported by five piers and standing nearly 300 feet tall. The girder launching process involved launching four main steel girders uphill from west to east using a hydraulic launch system that erects two girder pairs one span at a time until the total length has been launched. Flatiron erected the girder pairs in a 410-foot launching bed located behind the west abutment that had been graded at six percent with a curve to match the profile of the bridge. The team erected each girder pair, along with all the cross frames and lateral bracing, on the launching bed. Flatiron then launched two girders approximately 250 feet to the next pier where they rested while the next two pairs were erected and launched. The project also included demolition of the existing Park Bridge, an underslung truss bridge built in the 1950’s. Engineers performed structural analysis to ensure strength and stability of the bridge throughout all phases of demolition. The bridge’s concrete deck was saw cut and removed with excavators. Sections of the truss were flame cut and removed in cantilever fashion with cranes positioned on the approach spans of the bridge. The piers that remained were precisely drilled, blasted and removed from the site. Throughout this dismantling portion of the project, crews were especially vigilant to prevent debris and contaminants from entering the river or from falling onto the railroad crossing below. Extensive coordination was conducted with regulatory agencies and the Canadian Pacific Railway during this portion of the operation. 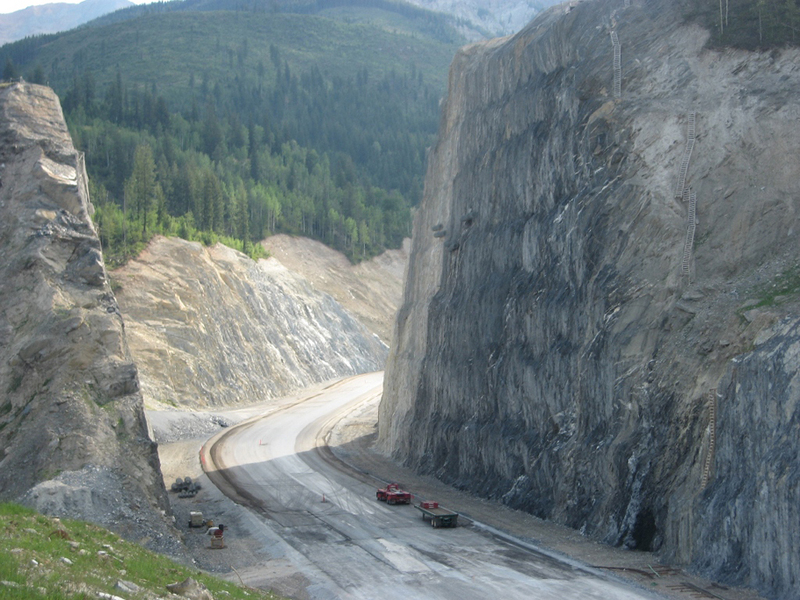 Additional work on the project included 260-foot rock cuts and three million cubic yards of excavation. Kicking Horse Pass is a portion of the scenic Trans-Canada Highway that runs between Golden and the Yoho National Park’s western border in British Columbia. The new alignment eliminates steep grades and sharp curves that posed a danger to the two million vehicles that travel this stretch of highway each year. The project opened early to traffic. Visitors are able to park nearby and walk the old highway’s path to the west side abutment, which has been converted to a scenic overlook. 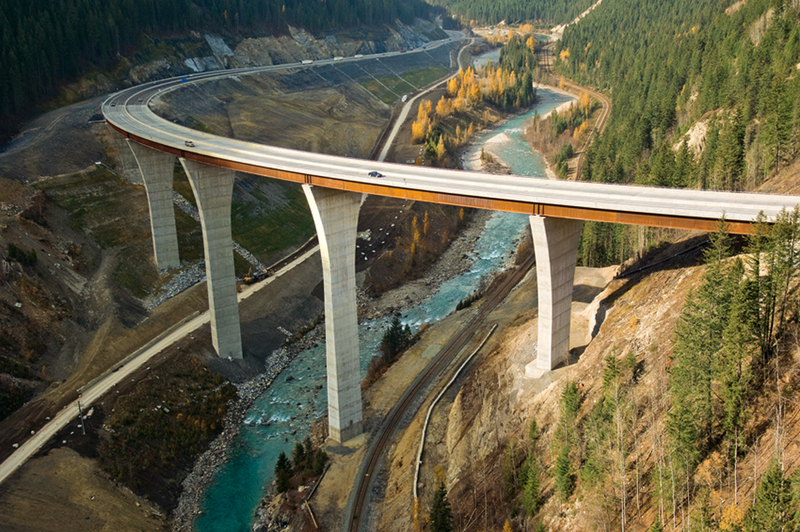 "The Kicking Horse Canyon project is … a tremendous engineering feat incorporating innovative designs delivered months ahead of schedule."